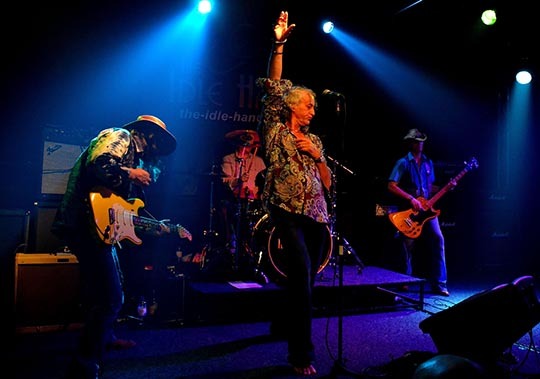 The Idle Hands are a British Blues Award nominated hard rock blues band acclaimed as “Britain’s best unsigned blues-rockers” by Classic Rock Blues Magazine in 2012. Their original songs are deeply influenced by iconic acts such as Zeppelin, Purple, Gallagher and Hendrix amongst notable others but always retain a unique classic individuality. World-class guitarist Dave Robinson's driven sound and exquisitely skilful fretwork intertwine dynamically with charismatic frontman Phil Allen's passionately powerful vocal melodies, whilst proficient rock solid bass rhythms of Jamie Burns & drummer Paul Heydon cement the powerful 4 piece together. Capably blending electric and acoustic material, The Idle Hands receive consistently high praise for their high quality cds, captivating live shows, superb musicianship and stage-craft. In 2013, Blues Matters Magazine Writers Poll saw them hit 3rd place in 'Best British Band' and top 3 in other individual musician categories. 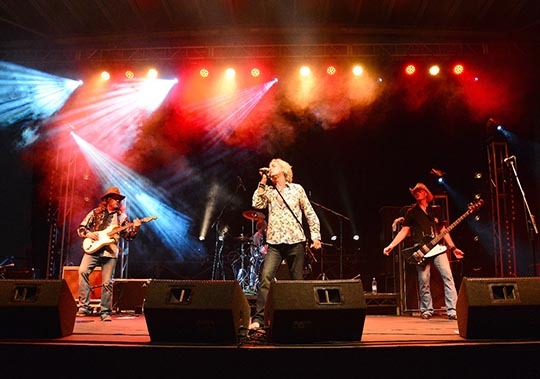 All of this combines to put them in increasing demand on the live circuit and definitely a band who are frequently acclaimed as "not to be missed"! Championed as “Britain’s best unsigned blues-rockers” by Classic Rock Blues magazine in September 2012, The Idle Hands have recently been picking up similar accolades from several other high profile publications with such praise as “a must see live” and “not to be missed”, whilst citing the cd’s as “guitar fireworks and impassioned vocal class” or acclaiming “British blues doesn’t get much better than this”. Based in Chesterfield UK since 1989, this hard working, long established 4 piece have 6 high quality cd’s under their belts and passionately present captivating live performances of raw original blues rock with their own unique, distinctive style and sound heavily inspired by the likes of Hendrix, Zeppelin & Gallagher. The band ooze considerable stage presence; charismatic, engaging powerhouse frontman Phil Allen in the Plant/Rogers/Gillan vein and inspirational world-class Strat slinging guitarist Dave Robinson in Page/Gallagher mode they are solidly backed by the rock solid rhythmic bass and drums of Jamie Burns & Paul Heydon. This is a band whose reputation for hook-laden original songs and engaging emotionally driven shows is fast gaining momentum. With many prestigious gigs behind them, The Idle Hands consistently wow audiences, gaining immediate re-bookings on a growing schedule which most recently included the 2011 & 2012 Skegness Rock & Blues festival, 2011 British Blues Awards Newark, 2012 Colne Festival British Stage, 2012 Hebden Bridge Festival Main Stage & 2012 Cambridge Rock Festival, whilst picking up support slots to the likes of Robin Trower, Aynsley Lister, Quireboys, Robert Harts Bad Co, Dan Baird, Climax Blues, Marcus Bonfanti and other distinguished acts. Nominated finalists in the 2012 British Blues Awards ‘Best Song’ category, highly praised by respected Blues musician and broadcaster Paul Jones, championed by Rick Wakeman with airplay on Planet Rock Radio and finalists in Classic Rock High Voltage Festival ‘unsigned bands’ contest 2011 the success story is building. Music publications comments speak volumes: Blues in Britain: “British Blues Rock at its best”, R2 Magazine: “original, enthusiastic & passionate”, Blues Matters: “phenomenal vocals & accomplished musicians”, Classic Rock UK; “fine musicians, amazing, original, bold & British”, Powerplay: “do your ears a massive favour”. This is no overnight success story, but after grafting hard to earn their spurs the future looks bright for the ‘Idles’ and as these down- to-earth, dedicated and approachable guys say - “Upward & Onward’ ! It has been said several times recently by various notable broadcasters and media writers, but it’s well worth repeating once more that “this is definitely a band on the rise and going places, so catch them while you can”! Thanks to all you stalwarts for making the first Tubby's Show of this New Year such a success. We had a great turnout and what a show we had too. The Idle Hands travelled all the way down from Chesterfield. Their superb set comprised all of their own music apart from their encore medley. It is always difficult to present an audience with your own songs because some of them will require several hearings before they really register. But I must say they pulled it off excellently. They are a very tight band and know how to change the dynamics of their set to maintain the audience’s interest. Phil Allen is a superb frontman and performer. He immediately connected with the Tubby’s audience. Dave Robinson is phenomenal on lead guitar, pulling out all the tricks. Some really driving solos holding the audience transfixed with his dexterity and shear mastery of his instrument. Great Bass playing from Jamie Burns too, lots of funk and slap when required but good old driving rock bass too with solid support on the drums from Paul Heydon. The next band to hit the stage were The Idle Hands from Chesterfield. 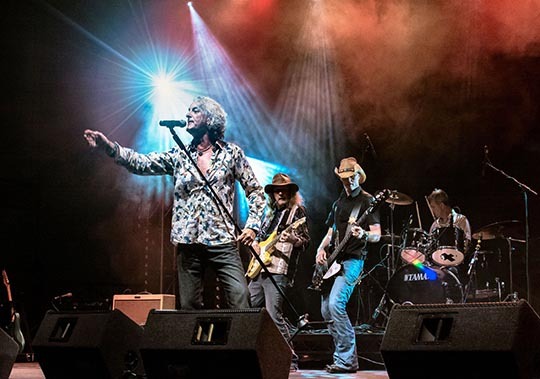 A great blues rock band fronted by talented vocalist Phil Allen. They are a band made for the 'big' stage, with great presence and showmanship. This four piece band featured original songs and some expertly reworked covers from influences such as Zeppelin, Gallagher, Hendrix and also included the Delta blues. Some excellent guitar work from Dave Robinson, and was well supported in the rhythm section by Jamie Burns on bass and Paul Heydon on drums. Also one of their original compositions was nominated in the 'Song Writer of the Year' for the British Blues Awards 2012. A class act so well worth checking out. Good bands are in plentiful supply these days. However, great bands are instantly recognisable by the quality of their own songs and calibre of musicianship, confident ownership of the stage and respect they mutually share with their audience. Make no mistake; The Idle Hands are a truly great band. 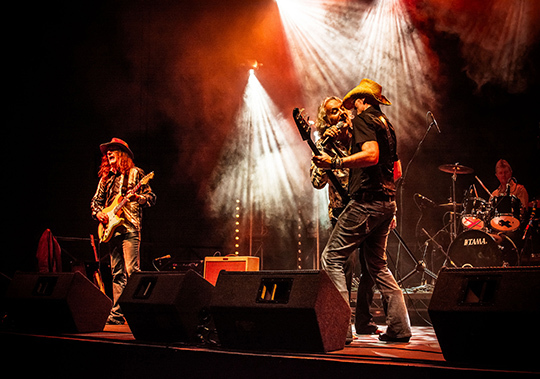 As Friday nights’ headline act in Jaks bar at the 2012 Skegness Rock and Blues festival, the band confidently took to the Blues Matters stage and for the next 90 minutes or so delivered a master class in classic Blues Rock. The place was packed and judging by the rapturous welcome they were afforded, many had come specifically to see these guys in anticipation of witnessing one of those memorable festival performances from a band very much on the ‘up‘. They weren’t to be disappointed. Opening with ‘Smell The Funk’ the band paced themselves through a set of mostly original tracks from their last two albums ‘All Night Sinnin’ and ‘Ready For Business’. Sliding seamlessly from the opener into Jamie Burns solid undulating bass line of ‘Mississippi’, they barely paused for breath as commanding and traditionally barefoot vocalist Phil Allen introduced more apparent favourites. The raw boogie of ’All night sinnin’ and the Planet Rock playlisted ‘I ’ain’t broken’, quickly followed up with the groove of ‘A place like this’ from their latest cd, the band were absolutely on fire. The pace steadied with a splendid version of Johnny Winters’ ‘Blue Mood’, which cut beautifully into an original slow blues called ‘40 Nights’, showcasing one of the stand out guitar solos of the festival for me; Dave Robinson must undoubtedly be one of the best and most gifted guitar players on the circuit today. The sustain he coaxed from his tortured yellow Strat’ was quite literally one of those ‘hairs on back of neck’ moments. Sheer blues poetry and the well deserved rapturous response to the track said it all. ‘Drive’ was up next followed by the perennial Hendrix classic ‘Voodoo Chile, Slight Return’ though fabulously stretched out as the band jammed effortlessly together, weaving patterns, exploring themes and incorporating tantalising segments of Catfish Blues and Zep’s Whole Lotta Love, much to the delight of the now mesmerised crowd. At the song’s end, the band took a moment to enjoy the rapturous applause from the audience and give Dave time to switch guitars for the rocking slide play of ‘Weep and moan’ and the infectious shuffle blues of ‘Come share the blues’. A fine rendering of Rory Gallagher’s ‘Off the handle’ and from here on in this quite remarkable Chesterfield band could do no wrong. The title track from ‘Ready For Business’ followed, as did the tasteful and highly commercial ballad ‘Take A Closer Look’, whilst ‘Keep up with the Jones’ powerfully hammered home some breakneck speed boogie with precision percussion from Paul Hayden. The main set concluded with ‘The Idles’ take on the Fleetwood Mac classic ‘Oh well’ again played at pace with Phil encouraging a more than willing crowd to sing the verses a-capella with him. Unlikely to be allowed to leave the stage at this point, they returned to encore with a bouncing ‘Bullfrog Blues’ with another crowd sing along when Phil entices willing participants to attempt to match his mighty lung power…’Well did you eeeeeeeeeeeever’ (close but no cigar good people) incorporating a sliver of Led Zep’s Rock And Roll for good measure and finished off by an all too short drum showcase for the impressive Paul Hayden. 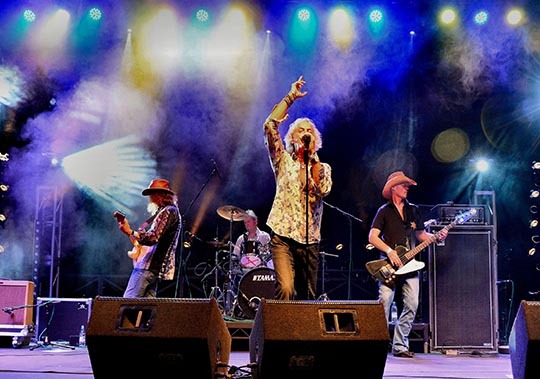 Have you ever considered a British Blues Band, with a Classic Rock vocal? It’s awesome and its unique! Step right up for "The Idle Hands".....Chesterfields best kept secret. 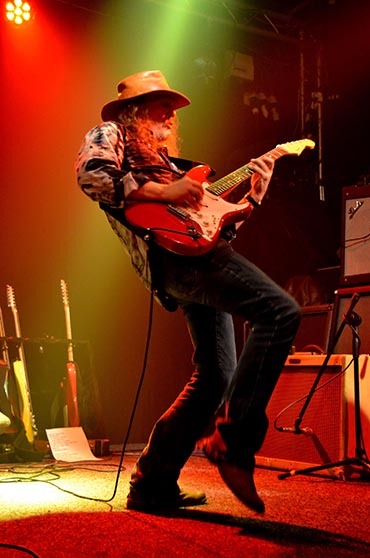 Classic Blues Rock - a lot can hide within such a genre, but let’s face facts, this Band makes you sit up and take notice with their originality. "The Idle Hands" who are anything but idle, are talented writers and musicians; connected as if family, so relaxed in each other’s company, they move as one, tight, precise, and with a very classy sound. The foundation of this comes from a drum and bass heartbeat (Paul Heydon and Jamie Burns), SO solid that the Devil himself could not tear them apart!. A more versatile guitarist (Dave Robinson) it would be hard to find these days, a kaleidoscope of styles to match the axes parked on stage, with a slide guitar tone sent from a guardian angel, his art is truly amazing listening. The luxury of a dedicated vocal makes a profound distinction from other bands; the next level up from a classic 3-piece, but just as crisp, sharp and direct, leads you down avenues of great musical worth. Its about time the punters had a front man (Phil Allen) with such good diction, personality, presence and yes....Volume, the lung capacity of 4 oxen at the very least!. More than value for money, their songs will lead you into the dainty. "Dirty Old Rag", fabulous slow Blues in "When Shadows Fall/ Lay My Burden Down/ When I First Met Chicago", a retro touch in "The Truth", and heartbreak " Take a Closer Look". In a live setting, the homage paid to 70s Rockers Zeppelin et al.... is there for all to hear, but always with a fresh new touch. A light peppering of cover versions done as well as this just adds to the flavour of the set. When they slow it down with "Come Share The Blues", they fill a gap in the current music market....the latest album "Ready For Business" is well produced and seemingly faultless. Go listen to it. Congratulations Chesterfield, and thanks for sharing them with us, they really Rock!. I was delighted to witness this four piece band from Chesterfield playing their debut gig in Chorley, yes the band THE IDLE HANDS had hit town. 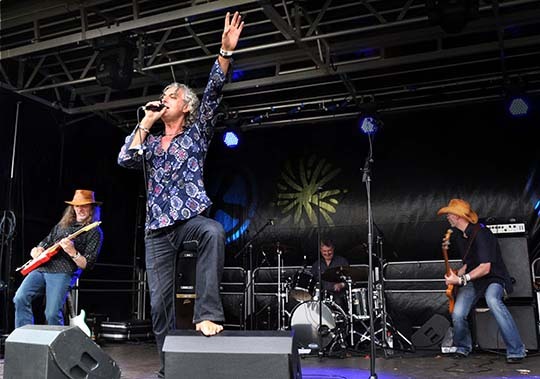 This was a full on powerful performance by lead vocalist and front man Phil Allen, he has that rapport with an audience an instant vibe and commanded the stage and all in his bare feet. The band played their original music which they produced in 2011 and got rave reviews from many blues magazines and air play from Rick Wakeman no less. The band is at the top of their tree musically and I have no doubt that they have a big future in front of them. The new album entitled “Ready for Business” is a cracker, a mix of slow blues ballads and up tempo rock and roll. You can feel the bands links to Led Zeppelin but they are their own men when it comes to the nuts and bolts of their original offerings, just superb. The magnificent lead guitar of Dave Robinson his skilful artistry is very much in evidence here you could put him alongside any guitar hero and he would be at home. The rhythm section is a megaton of power surging through the band on a Gibson bass guitar Jamie Burns just a brilliant musician a thumping /funky groove and a great sound, and the timekeeper on the drums Paul Heydon a terrific drummer a solid tight performance he has been with the band for about four years what a fantastic find. This band are value for money and are a high energy outfit they blew away the enthusiastic faithful crowd which were well entertained if the encores are anything to go by. Phil and Dave chatting after the gig told me that they were over the moon and the crowd had made them feel very welcome and appreciated their support. I have to say that this band collectively raised the bar across the board and well worth a look at if playing near you. To add to the bands sizable character I am told that they will be appearing at the Colne Blues Festival on the British Stage this August, that’s a reason to go if nothing else.